Featured here are some of those weapons. This list is by no means comprehensive; we have contented ourselves with select ones that highlight significant features of the overall strategic landscape. Defensive systems: Light armor (though not on gun itself). Hardened against EMP. Comments: Sats capable of mounting heavy guns might be configured around DE (i.e., laser, particle beam, or microwave cannon) or KE (typically mass-drivers or very heavy KE gatlings). 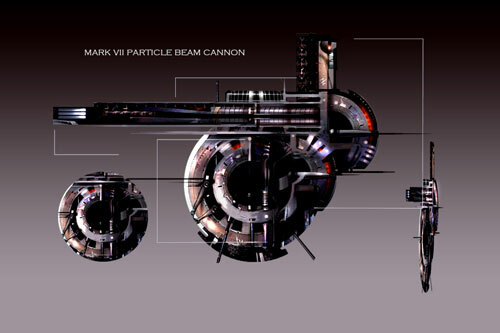 This particular illustration depicts a particle beam cannon; unlike those particle beams used in atmosphere, this one is neutral rather than charged, and can thus be expected to strike targets in vacuum only. Note that the relatively light shielding on this craft (and the fact that it's built around a single gun) mean that it'll be lucky to get off more than a single shot in a full-scale exchange (which is why thousands have been deployed). Defensive systems: ECM suites; armor; kinetic/infrared countermeasures. X-130: Suborbital capabilities: interceptor-class scramjets, heavy booster rockets. Janus: Thrust of X-130 and ship's own light rockets enable orbit. Rockets duplicate as orbital thrusters. Comments: Two-stage-to-orbit configuration enables dual mission; X-130 can deploy hardware/weapons into orbit while swooping back upon the Earth to deploy additional munitions. However, the maturation of Omaha-class hypersonic missiles have diminished the need for larger spaceplanes. 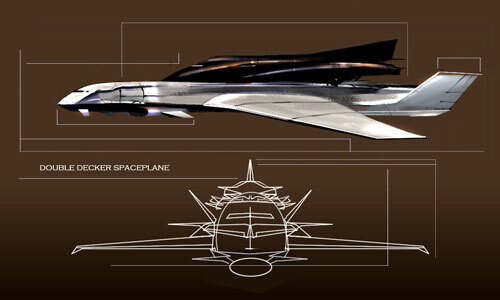 As of 2110, the X-130/Janus combo is primarily utilized for transport purposes rather than combat. 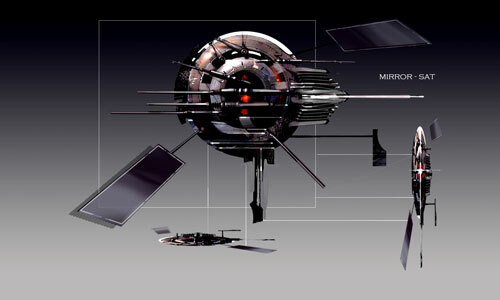 Defensive systems: ECM, armor; can modularize into multiple self-sealing units. Comments: Surrounded by the U.S. Second Fleet, the Montana is the second-largest U.S. craft in existence: only the Nantucket at libration point L5 is larger. 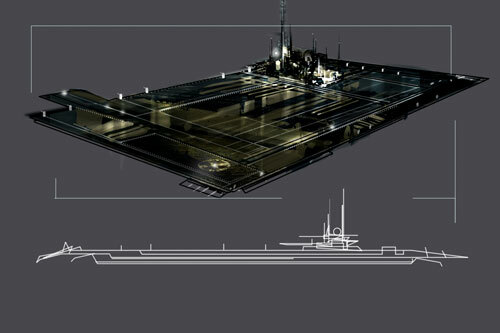 Serves as mothership for underwater, surface, air vehicles; maintains two fully-equipped launch pads capable of supporting heavy space lift. 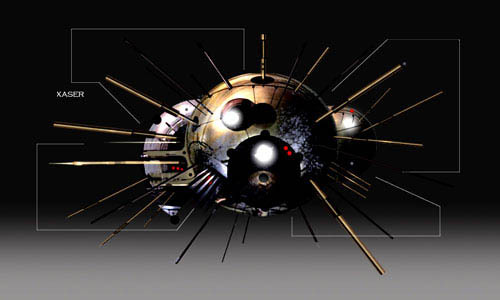 Defensive systems: DE can be repurposed against incoming attacks; in addition, the armor is so strong it could survive a direct hit from a tactical nuke. 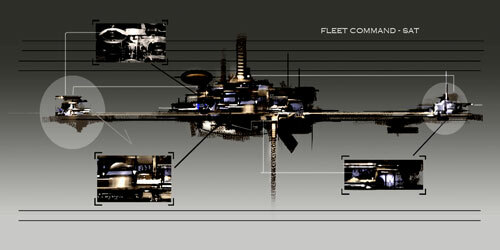 Mobility: 20 kilometers an hour; however, in practice, this ship remains immobile. Comments: The inevitable response to weapons too fast to dodge was to make ships too big to sink. A single Raft possesses (and carries) the firepower of more than a hundred carrier groups of the early 21st century. Ten Rafts are currently operational: two in the North Atlantic, two in the South Atlantic, one in the Indian Ocean, three in the eastern Pacific, and two in the Arctic Ocean. 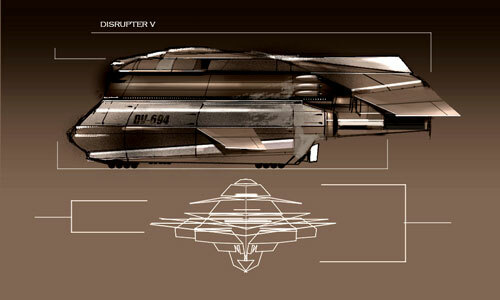 Mobility: Orbital thrusters allow for some evasive action against non-DE weaponry. Comments: Both sides have deployed mirror-sats in substantial quantities at most orbital levels, thereby allowing lasers to "bounce" their light of the sats onto targets not otherwise reachable. Defensive systems: Infantry-centered ECM. Suit is fully insulated against chem, nuclear, EMP. Mobility: Rockets possess fuel for more than thirty minutes of flight. 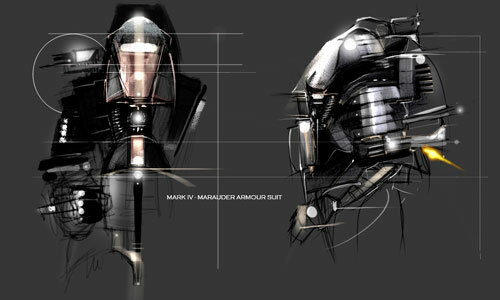 Comments: Larger than the more versatile suits employed by special-ops units, Marauder armor constitutes the standard heavy armor employed by assault troops in vacuum. Defensive systems: Armor, EMC suite. EMP hardened. Often rigged with a shroud to disguise their true nature. Comments: Third-generation nuclear weapons: a xaser is a nuclear device surrounded by metal rods that channel a detonation's x-rays. Generally regarded as the single most lethal directed-energy weapon in existence.